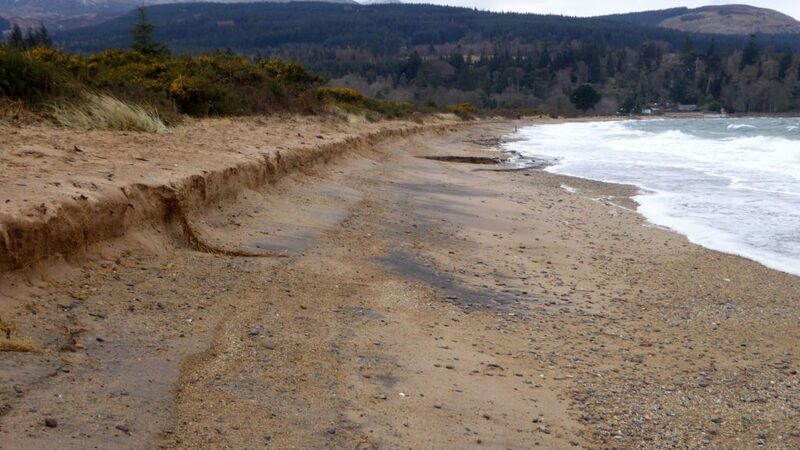 How sad to see Brodick beach getting another battering. As we watched the Easterly waves pounding the beach last weekend we knew what the end result would be – and it is worse than we feared. Almost all the sand gifted by George Leslie Ltd when digging the foundations of the new ferry terminal has now been washed away, much of it over to Cladach. The rock groyne which was built at the start of the Fisherman’s Walk has done some good at retaining the sand and Brodick Improvements Committee, who work tirelessly and what seems a never ending task, have pledged to extend this and carry out other remedial works. The government and North Ayrshire Council have plans in place to combat coastal erosion, but what is really needed is a long-term project, backed by a financial commitment, to spend the sort of money needed for proper sea defences, but we can’t see that happening any time soon. For now we can only hope that the worst of the winter storms are over.